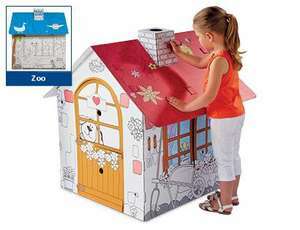 Playing house is always fun for kids and even more so when they get to decorate it themselves. Constructed of sturdy cardboard, the playhouse folds up and down in one easy step. Colour it, paint it or glue things to it, great for birthday parties, sleepovers, or the perfect gift. brilliant! have helped to decorate one of these houses when looking after someones kids. spent hours on the project with the children. Good fun. kept them busy.